Will You Join Marcus by Racing Against Cancer at the Singtel Race Against Cancer 2016? 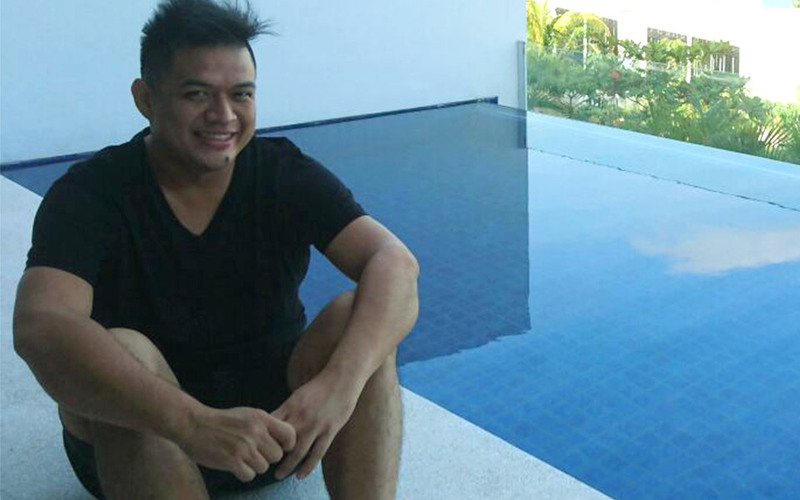 Will You Join Marcus at the Singtel-Singapore Cancer Society Race Against Cancer 2016? For anyone who thinks that cancer is strictly visited upon older people with bad lifestyle habits, it can come as a shock to learn that young people who have done everything right regularly succumb to this disease, and at very early ages. 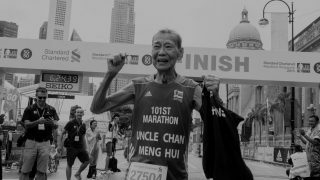 As the Singtel-Singapore Cancer Society Race Against Cancer is again on the horizon, we are reminded of a story that drives this point home. 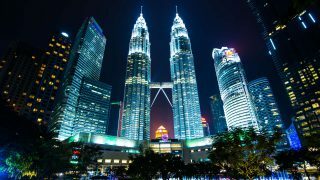 One of the most compelling stories we've read about how insidious this disease can be involves a young man named Marcus Chan. Just on the brink of life, Marcus is 30-something, yet his life story is already marked by great tragedy and each year that he runs the RAC race he has someone very special in mind from the moment he leave the start line to the moment he reaches the finish line. Marcus's first RAC run - back in 2011 - was in support of his beautiful, young girlfriend after she received a cancer diagnosis. Marcus had two choices when he learned the news: run away or stay and battle cancer every step of the way and by her side. A man of principle, he chose the latter and did everything he could to make sure she received the best care, plenty of love and a shoulder to cry on when things got tough. Marcus has seen first-hand what the power of people can do when they come together to raise critical funds for the disease that is often called the biggest threat to people of all ages because cancer has so many faces. Breast. Testicle. Colon. Liver. Bone. Brain. Even blood can't escape the wrath of cancer, which is why detection, treatment and awareness are essential to diagnose the many forms of this disease. How pervasive is cancer in Singapore today? About 37 people receive a diagnosis every day of the week, and in terms of numbers, 29-percent of these diagnoses are breast cancer in women, with colorectal cancer in men coming in second at 17-percent and 13-percent of women presenting with colorectal cancer. This means that 59-percent of all Singapore cancer diagnoses fall into either the colorectal or breast category types. A big advocate of early diagnosis and detection, Marcus saw first-hand how his love valiantly fought cancer. He became a walking expert on this disease, and learned the lessons that cancer sufferers and caregivers do: that despite progress made daily by scientists and clinicians, cures remain elusive, despite creative approaches and new treatments introduced every day. Why is this fight taking so long? 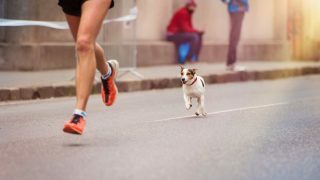 Because it takes a great deal of money to pay for these efforts, which is why it's profoundly important for runners of all ages and stages to sign up for events like the Cancer Society's Race Against Cancer so you can run with Marcus. 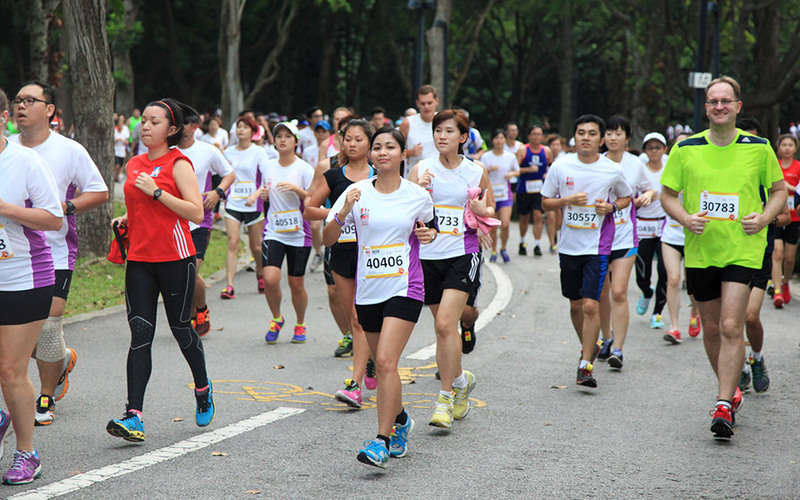 What can you expect if you participate at Angsana Green — East Coast Park — on 3 July? You'll receive more than you give! 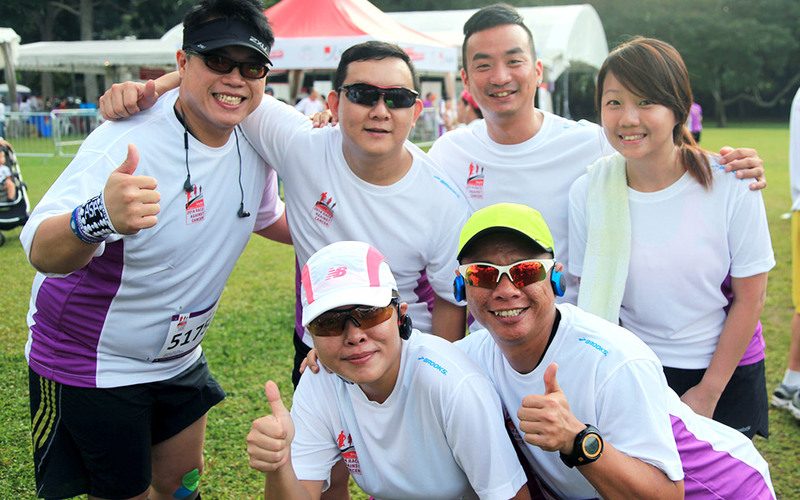 In return for choosing from the 5km, 10km or 15km circuit, you will help raise awareness, fund new initiatives and contribute to the great work Singapore's Cancer Society does 24/7. You’ll make a profound statement about your own dedication to eradicating cancer and you’re going to have a lot of fun doing it. Sure, you'll have to get out of bed early that summer morning so you're on hand for the 7:15 a.m. flag off, but if Marcus can do it, so can you, and in return for your sacrifice on a Sunday morning, you'll have done a yeoman job of raising cash for this worthwhile cause, and still be back home or at the office by noon if you must go! How much good will your effort do? 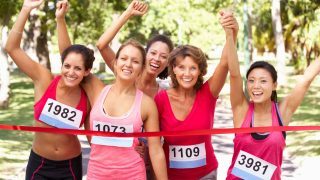 A single runner can raise enough to help fund free cancer screenings, hospice care, treatments, rehabilitation services, education initiatives and all-important research efforts. When it comes to setting lofty goals, leave it to this non-profit to go for the gold. 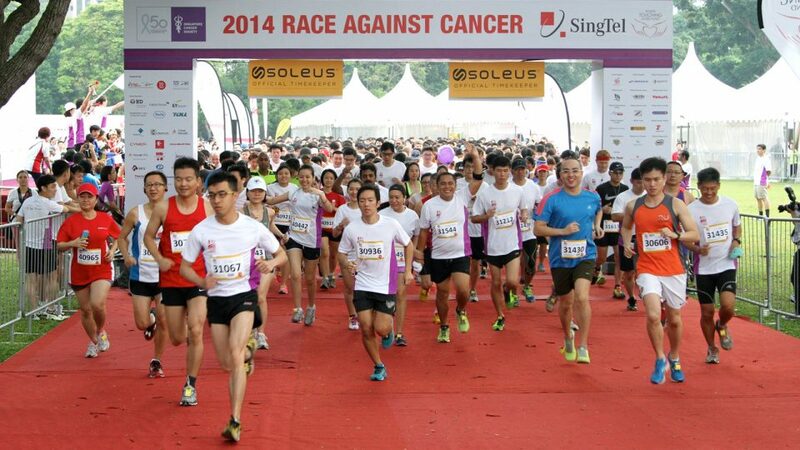 The Singtel-Singapore Cancer Society Race Against Cancer 2016 is hoping to raise millions of dollars and there are lofty attendance hopes: 10,000 people. The race shirt you receive when you collect your materials (at Velocity City on 25 and 26 June) is just one of the perks of running, and every time you wear it after the race, you send a message that your heart and legs are committed to a great cause. Even registering online is a breeze using the Internet. Singtel has sponsored the RAC 2016 for eight years and the Singapore's Cancer Society which is the organiser has been leading the nation's war on cancer for over 50 years, so you can anticipate running your race under the very best of circumstances since the organisers have become logistics magicians after this many years. If you meet Marcus, he'll be happy to tell you about his past experiences as he once again shows up on the start line with the love of his life on his mind who sadly, won't be there to welcome him at the finish line. 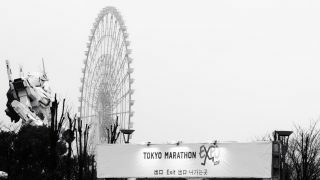 "I run this event in memory of my girlfriend. She was a believer, a strong fighter. Despite the pain she went through, her sheer determination saw her through her treatments. Her fighting spirit and strong belief towards living every moment fruitfully made me very proud of her." Do you have a good reason to be on hand for the 2016 Race Against Cancer? Will you show your commitment by registering right now? 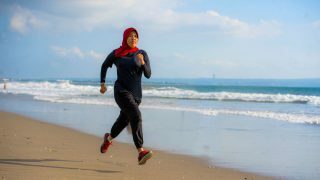 Why Run For Women on International Women’s Day?